After the fall of the Samoil's Macedonian medieval state in 1018, the region was turned into a Byzantine province. The high taxes which the Macedonian population had to pay to the Byzantine empire and the feudal rulers, were reason to start an uprising. The year of 1040 AD was an excellent timing. This uprising had liberation and anti-feudal character. The leader Petar Deljan, was a son of the second Macedonian tzar Gavrilo Radomir, the son of Samoil. His mother was a Hungarian princess, that Gavrilo Radomir threw out of the castle, when he fall in love the in the pretty Irene, from Larisa (city in Thessaly, Greece). Petar Deljan, who was born in Hungary, and in the region Moravia-Belgrade was welcomed by the organizers of the uprising. After crowning, Petar Deljan through Niš, entered Macedonia. On the way to Skopje he was welcomed again as a popular person. A lot of people from Greece, Bulgaria and Serbia joined the uprising, but their causes were different; for the Macedonians, Serbians and Bulgarians the uprising had liberation and anti-feudal character; only for the Greeks was anti-feudal. Soon there were enough people to start the uprising. In a mean time the people in the region of Drač (Durres) start an uprising with their leader, the brave soldier Tihomir. Very soon near Debar, the uprising troops met each other. They should arrange about the only leader of the uprising. But, soon after the troops found out that about the origin of Petar Deljan, they killed Tihomir. The nephew of Samoil, soon went to attack Solun (Salonica), where was the Byzantine emperor Michail 4th. Afraid of the Macedonian troops he escaped and left Solun. But the uprising troops failed to conquer Solun. Reason for this was Alusijan, the son of Ivan Vladislav. As soon as he heard about the uprising in Macedonia, he left the city Theodosiepolis and went straight to Ostrovo (today in Aegean Macedonia), where the camp of the uprising troops was located. Petar Deljan gave him 40,000 people to go and attack Solun (Salonica). But because of wrong strategy he failed to conquer this city. After he got back in Ostrovo, he blinded Petar Deljan and surrender himself to the Byzantine emperor. After this meeting of Alusijan and the Byzantine emperor, the blind Petar Deljan was to poor to fight against the Byzantines and he was soon discovered by the Byzantine troops and taken to Constantinople (Caridgrad, Instanbul). After this event there was no brave man, who could became a leader of the uprising and it finiished in 1041. 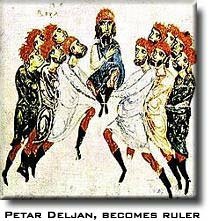 "Petar Deljan after his crowning - accepts his relative Alusijan"